So this week on the blog I thought I'd delve into the world of fashion, as it's been a long time since I delved into the "Fashion" aspect of my fashion, lifestyle and beauty blog. However, instead of writing a post about the trends that I love at the moment or my fashion must-haves, I thought that I would change things up from the norm and bring you the fashion trends that I wish would just disappear for good! I almost get it, it's a quirky pattern, it's bold, it's eye catching, you're bound to be noticed wearing this print, that and it's in at the moment, but for me leopard print (or any animal print really) has always been a no go zone. 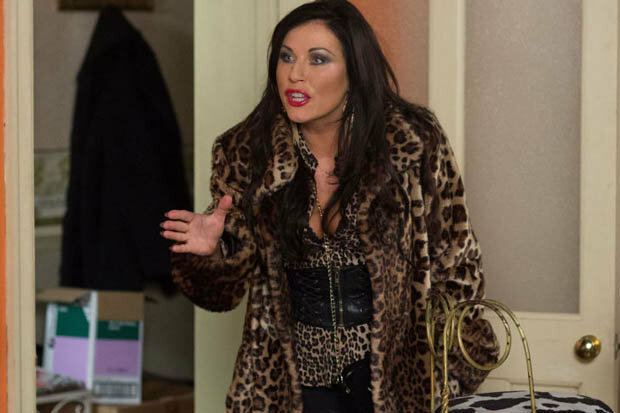 All that leopard print clothes remind me of is Kat Slater from Eastenders and I'm pretty sure that she only marginally pulls off the leopard print look. Or at least track suits that are being worn outside of their intended purpose, to be honest I've never understood the appeal of tracksuits, they either cling to you in all of the wrong places or are so baggy that they look like they'll fall down at the slightest movement. I remember the time when everyone wanted to own a velour tracksuit, preferably made by Juicy Couture, because just about every celebrity owned one or the baggy tracksuits with the stripes down the sides. To see track suits coming back into fashion really, really makes me cringe. The tracksuit is definitely a fashion trend that should stay trapped in the early 2000's. I'm not quite sure who thought that making clothes out of plastic was a good idea, let alone a good fashion choice, we all know that Kim Kardashian is a big fan of plastic shoes, but that doesn't mean that the trend should catch on. 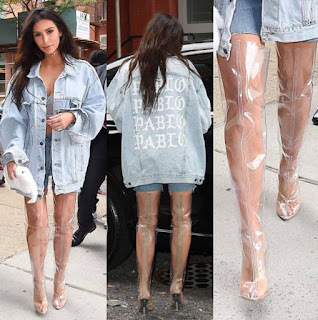 Firstly, who in the world is confident enough to show their feet off like that and secondly, how on earth would you trust your body not to sweat in the non-aireated ensemble, creating a massive condensated mess, not a good look! I just don't get this fashion statement, I know that the age of the trainer being a shoe that you'd only see in the gym has gone but why oh why do heeled trainers have to exist? Seriously, what is the point in them, can someone please explain it to me? The whole point of a trainer is either comfortable footwear or exercise footwear and these don't fit into either category. Imagine running on a treadmill in these, you'd break your neck! However, being honest, these would be perfect for pairing with your 'not for exercise' velour tracksuit. 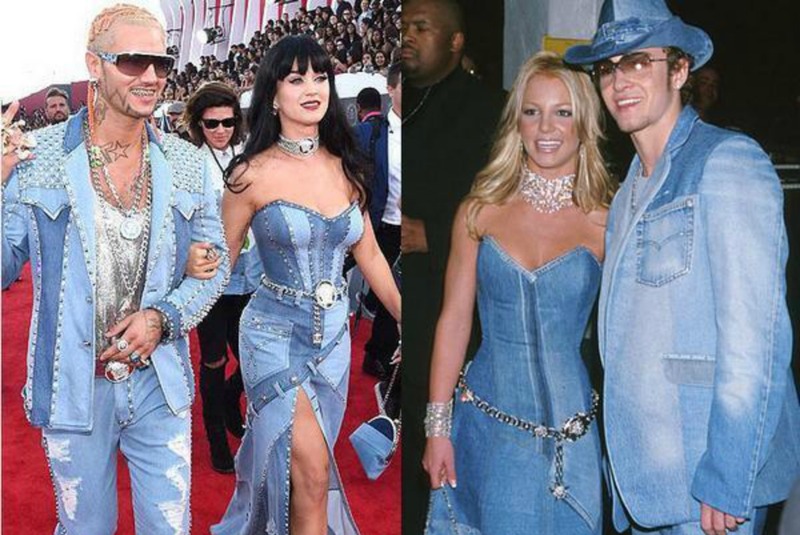 It wasn't okay when Britney and Justin did it in 2001, it wasn't okay when Katy Perry did it in 2014, it's not okay when you do it in 2018. Growing up I was taught the rule, you never double denim, especially blue denim, I've stuck to this rule my whole life and I think that, for the sake of fashion, it's a rule that the rest of the world should stick to as well. So, what do you think? Do these trends belong in the vaults of fashion history or do you want to see them live another day, let me know in the comments.